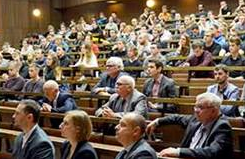 Last week, on November 29th, representatives of BHGE Warsaw and BHGE Elbląg met with the students of the Gdańsk University of Technology. Those students are thinking about continuing their education on the graduate specialization of the Subsea Technologies at the Faculty of Ocean Engineering and Ship Technology. The meeting – GE Day – took part for the fifth time as the part of a special cooperation between EDC and the University of Technology in Gdańsk. This partnership started in February 2013 and allows EDC to have influence on the studies program and it guarantee all Subsea Technologies students to have a payed, full-time internship at EDC. During the meeting, students listened to a lecture about subsea market trends and major subsea projects realized by BHGE. They also had chance to talk with EDC managers about perspectives for Warsaw site and EDC involvement in major global projects. There was a time for technical questions and for the discussion on study programs, EDC internship rules and Edison program. EDC Managers and the professors listened to the feedback from students and discussed together the plans for 2018, so that the studies can better align to the needs of the business industry. What’s important it was decided that next year, for the first time, the best master thesis written under the supervision of an EDC tutor, will be awarded with 6-month internship at EDC.